An HDF5 attribute is a small metadata object describing the nature and/or intended usage of a primary data object. A primary data object may be a dataset, group, or committed datatype. Attributes are assumed to be very small as data objects go, so storing them as standard HDF5 datasets would be quite inefficient. HDF5 attributes are therefore managed through a special attributes interface, H5A, which is designed to easily attach attributes to primary data objects as small datasets containing metadata information and to minimize storage requirements. The “Special Issues” section describes how to handle attributes that are large in size and how to handle large numbers of attributes. For more information, see "Special Issues." In the following discussions, attributes are generally attached to datasets. Attributes attached to other pri­mary data objects such as groups or committed datatypes are handled in exactly the same manner. 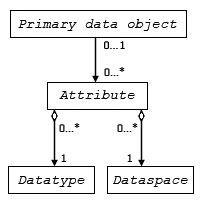 The figure below shows the UML model for an HDF5 attribute and its associated dataspace and datatype. Creating an attribute is similar to creating a dataset. To create an attribute, the application must specify the object to which the attribute is attached, the datatype and dataspace of the attribute data, and the attribute creation property list. Functions that can be used with attributes (H5A functions) and functions that can be used with property lists (H5P functions) are listed below. Creates an attribute attached to a specified object. Determines whether an attribute with a given name exists on an object. Deletes an attribute from an object according to index order. Removes an attribute from a specified loca­tion. Gets an attribute creation property list identi­fier. Retrieves attribute information by attribute identifier. Retrieves attribute information by attribute index position. Retrieves attribute information by attribute name. Gets an attribute name by attribute index position. Gets a copy of the dataspace for an attribute. Returns the amount of storage required for an attribute. Calls user-defined function for each attribute on an object. Opens an attribute for an object specified by object identifier and attribute name. Opens an existing attribute that is attached to an object specified by location and name. Opens an attribute for an object by object name and attribute name. Sets the character encoding used to encode a string. Use to set ASCII or UTF-8 character encoding for object names. Retrieves the character encoding used to cre­ate a string. Retrieves tracking and indexing settings for attribute creation order. Retrieves attribute storage phase change thresholds. Sets tracking and indexing of attribute cre­ation order. Sets attribute storage phase change thresh­olds. An attribute has two parts: name and value(s). HDF5 attributes are sometimes discussed as name/value pairs in the form name=value. An attribute’s name is a null-terminated ASCII or UTF-8 character string. Each attribute attached to an object has a unique name. The value portion of the attribute contains one or more data elements of the same datatype. HDF5 attributes have all the characteristics of HDF5 datasets except that there is no partial I/O capability. In other words, attributes can be written and read only in full with no sub-setting. If attributes are used in an HDF5 file, these functions will be employed: H5Acreate, H5Awrite, and H5Aread. H5Acreate and H5Awrite are used together to place the attribute in the file. If an attribute is to be used and is not currently in memory, H5Aread generally comes into play usually in concert with one each of the H5Aget_* and H5Aopen_* functions. loc_id identifies the object (dataset, group, or committed datatype) to which the attribute is to be attached. name, type_id, space_id, and create_plist convey, respectively, the attribute’s name, datatype, dataspace, and attribute creation property list. The attribute’s name must be locally unique: it must be unique within the context of the object to which it is attached. H5Acreate creates the attribute in memory. The attribute does not exist in the file until H5Awrite writes it there. attr_id identifies the attribute while mem_type_id identifies the in-memory datatype of the attribute data. H5Awrite writes the attribute data from the buffer buf to the file. H5Aread reads attribute data from the file into buf. The HDF5 Library converts the metadata between the in-memory datatype, mem_type_id, and the in-file datatype, defined when the attribute was created, without user intervention. Attributes can be accessed by name or index value. The use of an index value makes it possible to iterate through all of the attributes associated with a given object. To access an attribute by its name, use the H5Aopen_by_name function. H5Aopen_by_name returns an attribute identifier that can then be used by any function that must access an attribute such as H5Aread.Use the function H5Aget_name to determine an attribute’s name. To access an attribute by its index value, use the H5Aopen_by_idx function. To determine an attribute index value when it is not already known, use the H5Oget_info function. H5Aopen_by_idx is generally used in the course of opening several attributes for later access. Use H5Aiterate if the intent is to per­form the same operation on every attribute attached to an object. As with other attribute functions, attr_id identifies the attribute; buf_size defines the size of the buf­fer; and buf is the buffer to which the attribute’s name will be read. If the length of the attribute name, and hence the value required for buf_size, is unknown, a first call to H5Aget_name will return that size. If the value of buf_size used in that first call is too small, the name will simply be truncated in buf. A second H5Aget_name call can then be used to retrieve the name in an appropriately-sized buffer. H5Aget_space returns the dataspace identifier for the attribute attr_id. H5Aget_type returns the datatype identifier for the attribute attr_id. To determine the number of attributes attached to an object, use the H5Oget_info function. The func­tion signature is below. The number of attributes will be returned in the object_info buffer. This is generally the preferred first step in determining attribute index values. If the call returns N, the attributes attached to the object object_id have index values of 0 through N-1. It is sometimes useful to be able to perform the identical operation across all of the attributes attached to an object. At the simplest level, you might just want to open each attribute. At a higher level, you might wish to perform a rather complex operation on each attribute as you iterate across the set. H5Aiterate successively marches across all of the attributes attached to the object specified in loc_id, performing the operation(s) specified in op_func with the data specified in op_data on each attribute. When H5Aiterate is called, index contains the index of the attribute to be accessed in this call. When H5Aiterate returns, index will contain the index of the next attribute. If the returned index is the null pointer, then all attributes have been processed, and the iterative process is complete. op_func is a user-defined operation that adheres to the H5A_operator_t prototype. This prototype and certain requirements imposed on the operator’s behavior are described in the H5Aiterate entry in the HDF5 Reference Manual. op_data is also user-defined to meet the requirements of op_func. Beyond providing a parameter with which to pass this data, HDF5 provides no tools for its management and imposes no restrictions. Once an attribute has outlived its usefulness or is no longer appropriate, it may become necessary to delete it. H5Adelete removes the attribute name from the group, dataset, or committed datatype specified in loc_id. H5Adelete must not be called if there are any open attribute identifiers on the object loc_id. Such a call can cause the internal attribute indexes to change; future writes to an open attribute would then pro­duce unintended results. As is the case with all HDF5 objects, once access to an attribute it is no longer needed, that attribute must be closed. It is best practice to close it as soon as practicable; it is mandatory that it be closed prior to the H5close call closing the HDF5 Library. H5Aclose closes the specified attribute by terminating access to its identifier, attr_id. Some special issues for attributes are discussed below. The dense attribute storage scheme was added in version 1.8 so that datasets, groups, and committed datatypes that have large numbers of attributes could be processed more quickly. Attributes start out being stored in an object's header. This is known as compact storage. For more information, see "Storage Strategies." As the number of attributes grows, attribute-related performance slows. To improve performance, dense attribute storage can be initiated with the H5Pset_attr_phase_change function. See the HDF5 Refer­ence Manual for more information. When dense attribute storage is enabled, a threshold is defined for the number of attributes kept in com­pact storage. When the number is exceeded, the library moves all of the attributes into dense storage at another location. The library handles the movement of attributes and the pointers between the locations automatically. If some of the attributes are deleted so that the number falls below the threshold, then the attributes are moved back to compact storage by the library. The improvements in performance from using dense attribute storage are the result of holding attributes in a heap and indexing the heap with a B-tree. Note that there are some disadvantages to using dense attribute storage. One is that this is a new feature. Datasets, groups, and committed datatypes that use dense storage cannot be read by applications built with earlier versions of the library. Another disadvantage is that attributes in dense storage cannot be compressed. We generally consider the maximum size of an attribute to be 64K bytes. The library has two ways of stor­ing attributes larger than 64K bytes: in dense attribute storage or in a separate dataset. Using dense attri­bute storage is described in this section, and storing in a separate dataset is described in the next section. To use dense attribute storage to store large attributes, set the number of attributes that will be stored in compact storage to 0 with the H5Pset_attr_phase_change function. This will force all attributes to be put into dense attribute storage and will avoid the 64KB size limitation for a single attribute in compact attribute storage. The example code below illustrates how to create a large attribute that will be kept in dense storage. In addition to dense attribute storage (see above), a large attribute can be stored in a separate dataset. In the figure below, DatasetA holds an attribute that is too large for the object header in Dataset1. By putting a pointer to DatasetA as an attribute in Dataset1, the attribute becomes available to those working with Dataset1. This way of handling large attributes can be used in situations where backward compatibility is important and where compression is important. Applications built with versions before 1.8.x can read large attri­butes stored in separate datasets. Datasets can be compressed while attributes cannot. Note: In the figure above, DatasetA is an attribute of Dataset1 that is too large to store in Dataset1's header. 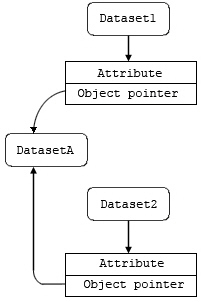 Data­setA is associated with Dataset1 by means of an object reference pointer attached as an attribute to Dataset1. The attribute in DatasetA can be shared among multiple datasets by means of additional object reference pointers attached to additional datasets. Attributes written and managed through the H5A interface cannot be shared. If shared attributes are required, they must be handled in the manner described above for large attributes and illustrated in the figure above. NULL can be used within a name, but HDF5 names are terminated with a NULL: whatever comes after the NULL will be ignored by HDF5. The use of ASCII or UTF-8 characters is determined by the character encoding property. See H5Pset_char_encoding in the HDF5 Reference Manual.